Did you know that historically, July has been by far the most dangerous month for boating accidents and fatalities? Last year was no different, with over 900 reported accidents during the month of July, primarily on the weekends, according to the United States Coast Guard 2013 Recreational Boating Statistics Report. What can we infer from this? Well, it's pretty simple actually. Boating activity increases during the summer months, and more activity equates to a higher chance of being involved in a boating accident. We want you to be safe, so you and your loved ones can stay safe this Independence Day holiday weekend. "We monitor the boating industry year round, and with warmer weather comes the increased potential for boating accidents. Education and awareness are key factors in preventing accidents. The purpose of any boating safety course or training material is to prepare boaters for a variety of scenarios in and out of the water." Let's take a look the Top 5 major contributing factors for accidents in 2013 and discuss how you can prevent being a statistic for 2014. Don't drink and operate a boat. Not only is it dangerous, but it is illegal. Plus, it inhibits your ability to make clear decisions out on the water. The motion of the water, the sun, heat and wind all heighten the effects of alcohol on your body and brain. It's easy, folks: boat sober. We should all know the phrase "don't text and drive." Well, if it's dangerous to distract yourself while driving a vehicle, pperating a boat is no different. Operators and passengers should always pay attention to their surroundings and be aware of what is going on. Operating a boat requires 100 percent of your attention so you can pick up on any potential hazards. Sometimes you just don't know what you don't know. That's why it's important for new boat operators to take a state-approved boating safety course. A boating safety course is often a requirement for boaters. Be sure to look into your state's requirements before hitting the water. While certain states do have speed limits in certain areas or during certain times of the day, going fast is completely needless in most situations. While boats have big engines, there's no good reason to max them out. Reports show that excessive speed is a main contributing factor in boating accidents and fatalities. Keep your speed at a safe limit so you can maintain more control over the vessel and adjust your course as necessary. Be sure to know the correct navigation rules. For more information, check out Boat Ed's video on proper navigation rules. You definitely don't want to stand-on when you should be giving way. That'll make for a bad day! While those five contributing factors only scrape the surface of what operators should be aware of while boating, at least if you hit the water with those points in mind you'll be able to proactively avoid any sticky situations. There's one rule when it comes to life jacekts: the only good life jacket is the one that's properly on your body. Wear the life jacket, wear the life jacket, wear the life jacket! We can't stress it enough, and the proof is in the pudding. According to the U.S. Coast Guard report, drowning was the number one cause of fatalities. Furthermore, of all reported drowning cases, 84 percent of the victims were not wearing a life jacket. What's the bottom line? Life jackets save lives — wear one. So, what's the takeaway? We want you to be safe. We want you to realize that there is a chance you could be involved in a boating accident. It might not be your fault, but the risk is there so it's best to hit the water prepared. Know the causes, go slow, don't drink and wear a life jacket. Boat Ed, produced by Kalkomey Enterprises, Inc., is North America’s leading provider of boating education manuals and online courses . Boat Ed partners with state agencies to provide classroom materials for instructors and online courses for students. Boat Ed’s expertise is a great resource for those who still want to learn how to be a safe and responsible boat or personal watercraft operator. 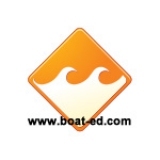 To study boater education online, please visit www.boat-ed.com, or email mstrobl@boat-ed.com for more information.